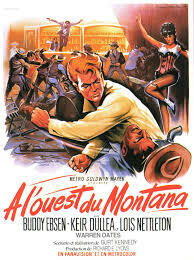 One more musical number, and this western comedy would have been a full-fledged western musical. 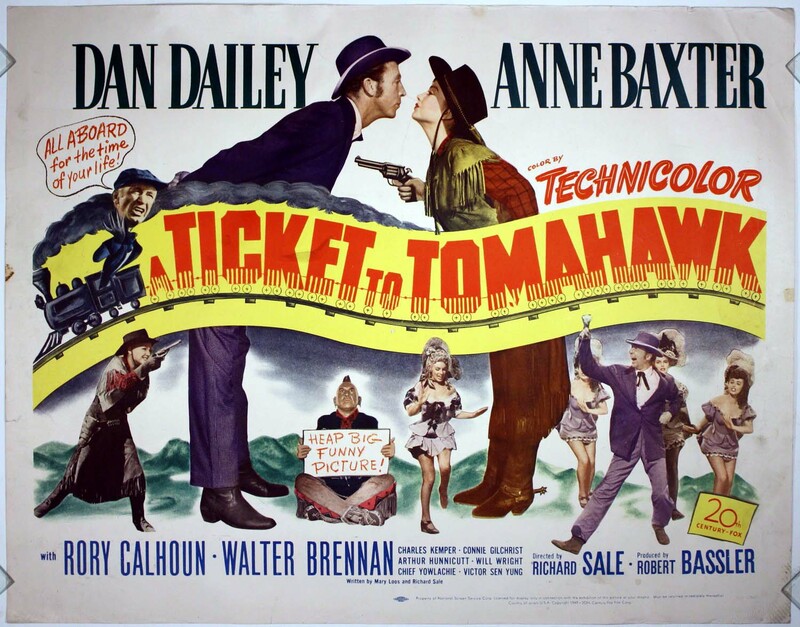 The fictional Tomahawk & Western Railroad needs to get a train to Tomahawk, Colorado, in early September 1876 to fulfill its charter, or it will lose its right to operate there. But it has enemies, primarily Col. Dawson, who runs the stage line in the area and doesn’t want the competition, and his henchmen; and the disgruntled Arapahoes led by Crooked Knife. And a few minor problems, such as the fact that of the final sixty miles of the line from Epitaph to Tomahawk, forty of those miles have no track. (Apparently fabricated in England, the rails were lost in transit off Cape Horn). A paying passenger has bought the ticket of the title; he is Johnny Behind-the-Deuce (Dan Dailey), a footloose, well-traveled card shark and drummer selling mustache cups. He arrives in Epitaph in company with Dawson henchmen, who wound Marshal Kit Dodge (veteran character actor Will Wright) so that his straight-shooting granddaughter Kit Dodge Jr. (Anne Baxter) has to take over the effort to get the train the last sixty miles. 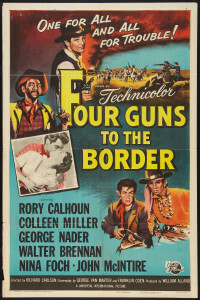 And they are joined by Dakota (Rory Calhoun), secretly another of Dawson’s henchmen; Madame Adelaide (Connie Gilchrist) and her troupe of theatrical “ladies”; a Chinese laundryman; and Kit’s stoic Indian watchdog Pawnee (Chief Yowlatchie, best remembered now for his role in the classic Red River). 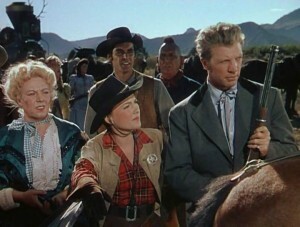 Miss Adelaide (Connie Gilchrist), young Kit Dodge (Anne Baxter) and Johnny (Dan Dailey) survey the damaged trestle, backed by Dakota (Rory Calhoun) and Pawnee (Chief Yowlatchie). [Spoilers follow.] In the last scene, Johnny is about to board yet another train. But finally he puts on the conductor’s hat and bids a temporary farewell to young Kit and their five daughters, who seem to bear the same names as Miss Adelaide’s girls. 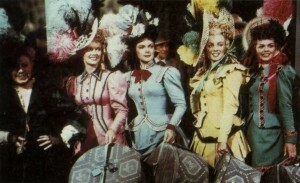 Miss Adelaide (Connie Gilchrist) and her girls. The one in yellow might look familiar. Of course, none of this is very serious and the sensibility is very much like Annie Get Your Gun, from about the same time. The gender roles and romantic expectations are very much of the 1950s, too, although Anne Baxter’s role as the younger Kit Dodge is a reversal of sorts. Dan Dailey showed up in musicals of the time (There’s No Business Like Show Business, Give My Regards to Broadway) but this may have been his only western. 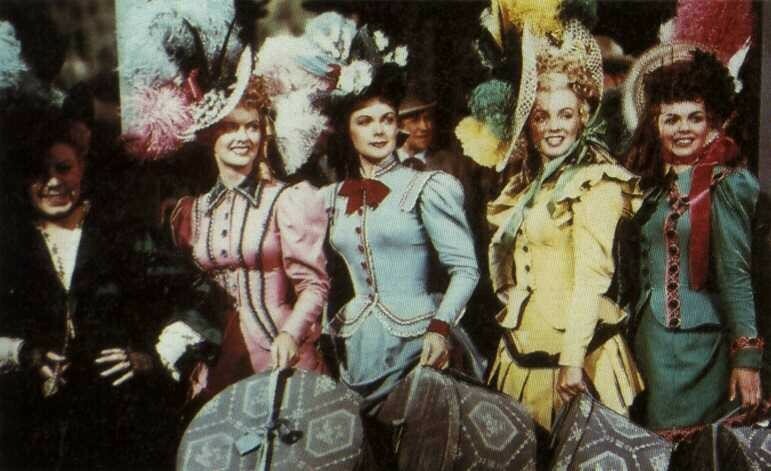 Anne Baxter was an excellent actress, but this isn’t among her most memorable outings generally (All About Eve, The Ten Commandments) or in westerns (Yellow Sky, Three Violent People, Cimarron). There’s a superb supporting cast, many of whom are underused. Walter Brennan does his shtick as the engineer of the Emma Sweeney (the locomotive involved). 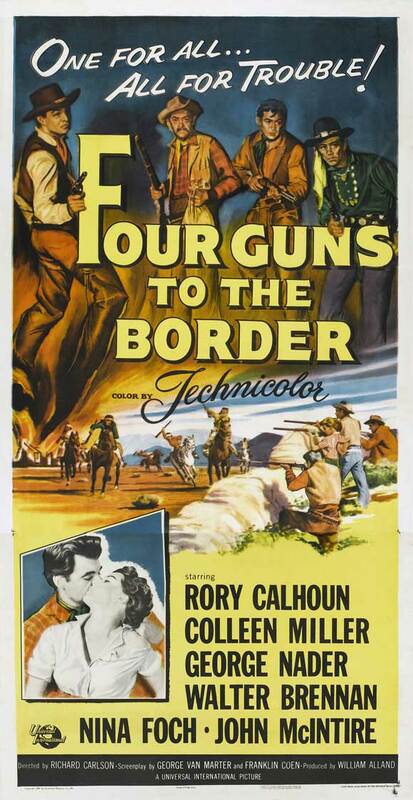 Rory Calhoun, in the early part of his movie career, keeps to his pattern of playing bad guys in big-budget productions like this (River of No Return, The Spoilers) and good guys in more modest efforts (Dawn at Socorro, Apache Territory). Arthur Hunnicutt was in his most productive period as a character actor (Two Flags West, Broken Arrow, The Big Sky) but has nothing here as Sad Eyes, the locomotive tender. If you have quick eyes, you might recognize Marilyn Monroe in an early role as one of Miss Adelaide’s girls; so you would be wrong if you thought her only western was River of No Return (1954), with Robert Mitchum and Rory Calhoun. Will Wright is perfectly cast as the elder Kit Dodge, and veteran villain (and former studio accountant) Jack Elam shows up without many lines as one of Col. Dawson’s henchmen. This is watchable, but not terribly memorable. Director Richard Sale was known more as a writer (he provided the improbable story and the screenplay for this) than a director, and his directing career (twelve films, of which this was the third) was not particularly notable. Shot in color, in and around Durango, Colorado, using the Denver & Rio Grande track. 90 minutes. 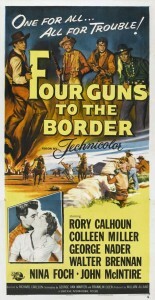 This entry was posted in Westerns Worth Watching and tagged Native Americans (Indians), Rory Calhoun, Technological Westerns, Western Comedies on August 30, 2015 by Nicholas Chennault. 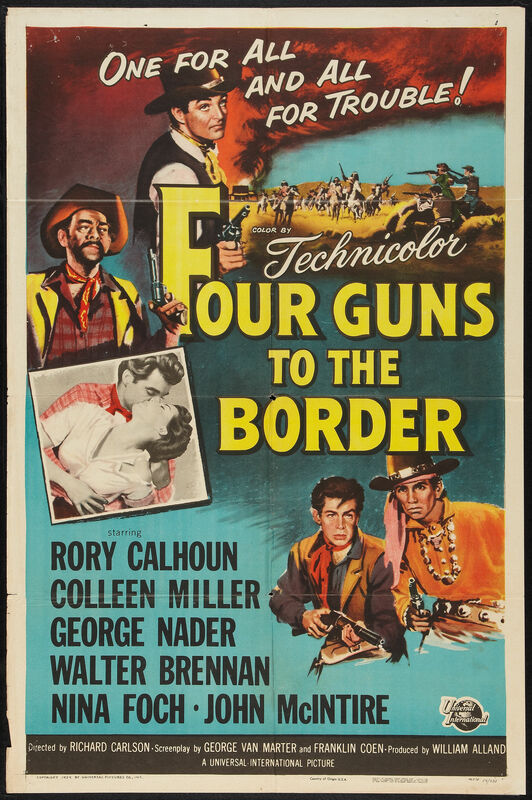 In 1881 the four riders of the title are moving through Apache country, presumably in Arizona or New Mexico, when they come upon Simon Bhumer (pronounced “Boomer,” played by Walter Brennan) and his nubile, tomboyish daughter Lolly (Colleen Miller), fresh from finishing school. 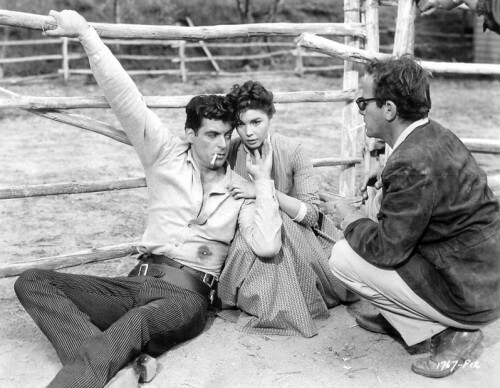 Both Cully (Rory Calhoun), the leader of the four, and Bronco (George Nader) are visibly taken with her, but Simon thinks none of them are good enough for her. In fact, he’s right. The four are headed to pull off a bank robbery, while Simon and Lolly are going back to his ranch in Shadow Valley through territory infested with Apaches. 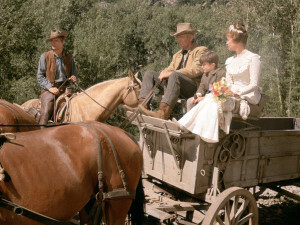 Simon Bhumer (Walter Brennan) and daughter Lolly (Colleen Miller) head for their ranch; but a heated relationship develops between Lolly and Ray Cully (Rory Calhoun). All six spend the night at Greasy’s general store, while Greasy (Nestor Paiva) reconnoiters in town to verify that the bank currently holds enough money to make robbing it worth while. Cully has a combustible scene or two with Lolly until Simon breaks it up. Gang members Bronco and Yaqui (Jay Silverheels) fight regularly, seemingly out of exuberance. Dutch (John McIntire) has known Simon a long time; they were both quasi-outlaws, until Simon went straight. The gang’s plan for the bank involves Cully creating a diversion while the robbery takes place, and then the gang bolts for the border. Cully and Sheriff Jim Flannery (Charles Drake, previously seen as Shelly Winters’ ineffective boy friend Steve in Winchester ’73) were once young hellions, both vying for the affections of Maggie (Nina Foch), who chose Jim. Cully picks a fight with Jim, which engages the town’s attentions until Maggie breaks it up. Having completed the robbery as planned, the four head for the border with a posse in pursuit. Back at Greasy’s store, they find it burned by Apaches, with Greasy dead. Sheriff Jim Flannery (Charles Drake) and Cully (Rory Calhoun) fight out old grievances. [Spoilers follow.] Meanwhile, Simon Bhumer’s horse goes lame, and he and Lolly are besieged by Apaches. Cully hands the loot to Dutch and takes off to help. Dutch gives it to Bronco and follows, and finally Bronco and Yaqui head for the battle, too. It’s a desperate matter, and one by one Dutch, Yaqui and Bronco are all killed and Cully is gravely wounded. Yaqui had used the bag of loot to bash an Indian, and the coins are scattered all over the site. Simon and Lolly take Cully to the Shadow Valley ranch, and when the posse arrives at the battle site to chase off the Apaches, only bodies and the scattered proceeds of the robbery are left. At the Bhumer ranch, Cully’s wound is bad enough so Simon has to go for medical help. Flannery and two deputies arrive and start to shoot it out with Cully. He calls out Flannery, while Lolly tries to talk him out of it. As Cully and Flannery advance to their showndown, finally Cully surrenders—persuaded at last by the love of a good woman. 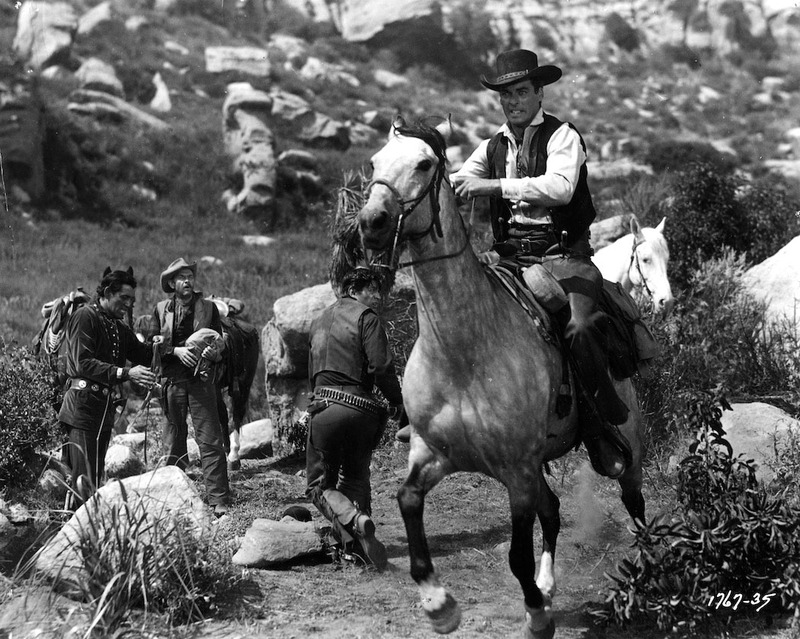 Cully (Rory Calhoun) rides to the rescue, while Yaqui (Jay Silverheels) and Dutch (John McIntire) look on. As a general matter, this is above average. Rory Calhoun is good here, and the film has also surprisingly strong female roles. Both Colleen Miller as Lolly and Nina Foch in a limited role as Maggie are good; Calhoun and Miller have good chemistry together. 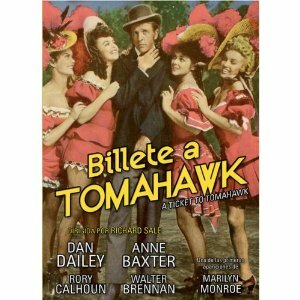 Jay Silverheels has one of his best roles, not to mention a very colorful costume. All in all, this is a good early Calhoun western. The ending, with Cully giving himself up, is not entirely satisfying, but it’s how such matters were handled in westerns from the 1940s and 1950s (see Joel McCrea in Four Faces West and Fred MacMurray in The Moonlighter for just two other examples). The good guy could not be allowed to get away with crime even if he was repentant, lest all society fall apart. Richard Carlson directs Rory Calhoun and Colleen Miller in their climactic scene. Richard Carlson is known mostly as an actor in supporting roles, but he directs competently here in his second feature. In color, at 83 minutes. This can be hard to find, since it is apparently not available in the U.S. on DVD. 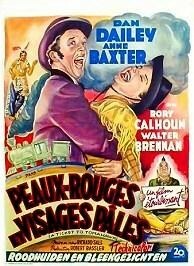 This entry was posted in Westerns Worth Watching and tagged Louis L'Amour, Manhunts, Rory Calhoun on August 26, 2015 by Nicholas Chennault. Almost as long as there have been movies, the black-clad avenger of Spanish California has appeared in them. 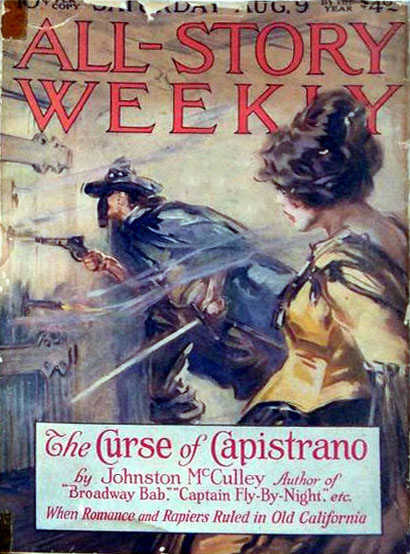 Johnston McCulley’s serial The Curse of Capistrano was first published in 1919 in the pulp magazine All-Story Weekly, to be followed by three more serialized Zorro stories in Argosy magazine. The first movie Zorro was one of the best, appearing in 1920, the year after McCulley’s original publication: the dashing and acrobatic Douglas Fairbanks. Five years later he starred in a sequel, Don Q, Son of Zorro. Zorro never entirely left the screen for any long periods, but the next notable cinematic Zorro was Tyrone Power, romancing Linda Darnell and memorably fighting Basil Rathbone in 1940’s The Mark of Zorro. 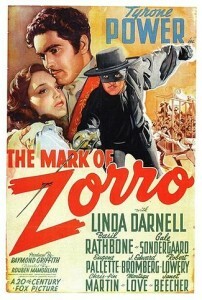 The 1940s also saw Zorro appearing in various serials, like Zorro’s Black Whip, Zorro’s Fighting Legion and The Ghost of Zorro. 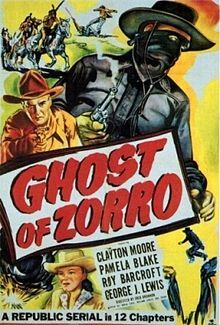 With the coming of television in the 1950s, Walt Disney provided the Baby Boomers with their most familiar version of the masked Californian—Guy Williams as the television Zorro. Disappearing from screens both large and small during the 1960s (except perhaps for a couple of spaghetti versions), Zorro came back in the 1970s to be played by Frank Langella and French actor Alain Delon. 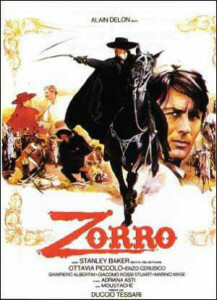 He was established enough as a cultural icon to be played for satire by George Hamilton in Zorro, the Gay Blade (1981). And most recently he came back to be played by both an aging Anthony Hopkins and Spanish actor Antonio Banderas in The Mask of Zorro (1998) and its less successful sequel The Legend of Zorro (2005). 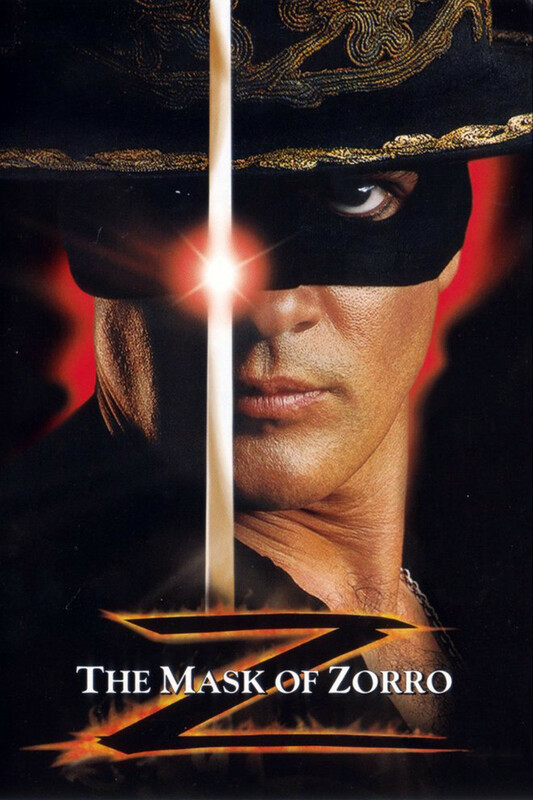 Historical note: Although Zorro is firmly attached to a particular time and place (pre-1820 Spanish Southern California, before Mexican independence), Zorro is not in fact an actual historical character but a fictional creation of a pulp writer in 1919. He is fun, though, when done well. 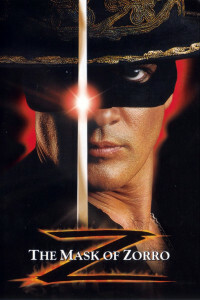 The Banderas Zorro movies attempted to merge the fictional Zorro with the actual Mexican-era bandit Joaquin Murrieta, with limited success. 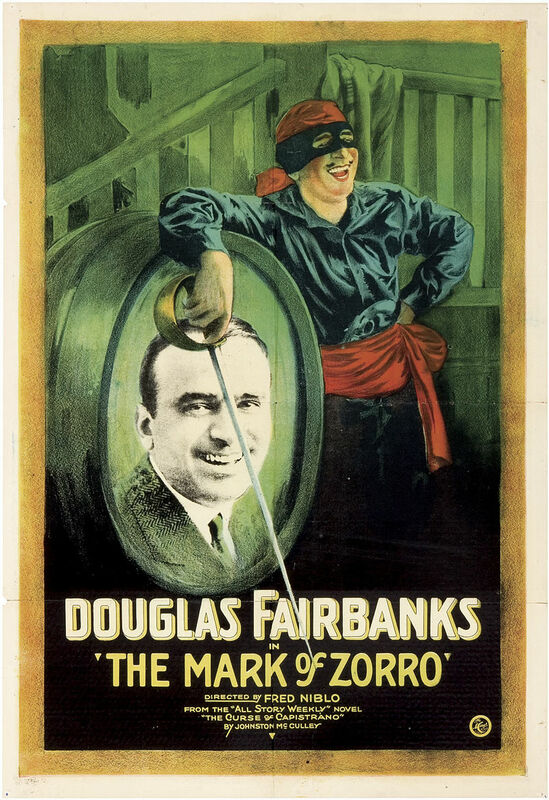 One of the problems with Zorro has always been that his primary weapon is the sword, which leads to exciting duels with the sword-wielding bad guys played by Basil Rathbone and others. But in an era when firearms were common, Zorro would have been in trouble relying on a sword or a whip too much. The Californian—Ricardo Cortez (1937), in an obvious version of the Zorro story with other names. This entry was posted in Lists and tagged Zorro on August 13, 2015 by Nicholas Chennault. 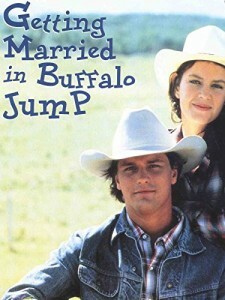 This Canadian television production is a modern romance set in ranching country in Alberta–a variation on the old theme of The Arranged Marriage. 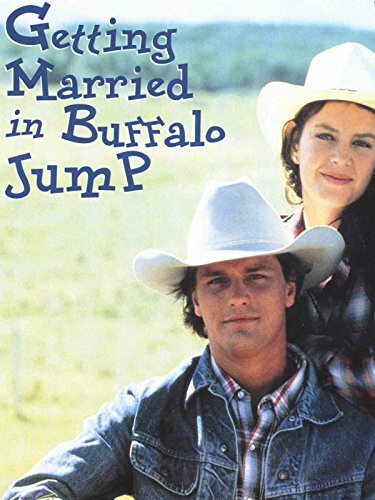 You can tell where it’s going from the title (Buffalo Jump being the fictional town around which this is all going on), but it takes the entire 137 minutes to get there. So the question is not what will happen, but how it will happen, given the disparate personalities involved. 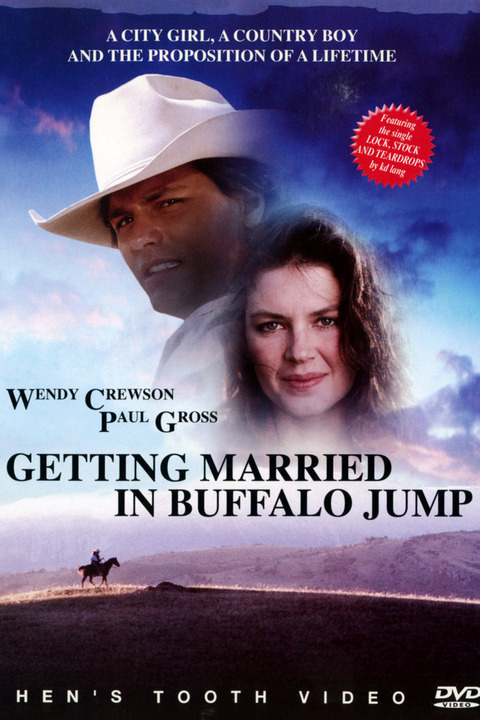 Sophie Ware (Wendy Crewson) has returned to Buffalo Jump fifteen years after graduating from high school there. She spent those years going to college in eastern Canada and working as a piano act in lounges in Toronto. Now her father has died, leaving her his ranch. She’s determined to keep it despite her Scottish mother’s continual insistence that she sell it, and she needs some one to help her with it. On the recommendation of Mrs. Bresnyachuk, she hires the woman’s son Alex (Paul Gross), whom she sort of knew in high school. Alex Bresnyachuk (Paul Gross) is good at ranching, but not so good at talking. Unlike Sophie, Alex is good on a ranch, persuading her to run more practical cattle instead of the horses her romantic sensibility is drawn to. He’s taciturn, seldom communicating much about his feelings. And he’s more traditional about male-female relationships than the cosmopolitan Sophie. After Sophie breaks a date with the local principal/math teacher to go out with Alex instead, he makes her a business proposition: she brings the ranch, he brings the working expertise, and they marry to continue the operation. This is not really how she’d envisioned this particular life event happening, and she rejects the notion … at first. Sophie Ware (Wendy Crewson) and Alex (Paul Gross) get to know each other in a scene that is not exactly typical of the movie. Alex had dropped out of high school and had come back to finish (in three months) at 22, after working for an oil company. His family’s farm/ranch is crowded, with four men (his father and two brothers in addition to Alex) in one house, he says. Sophie learns that Alex left town when he fathered a child with his Indian girl friend Annie Moore. Sophie finds Annie (Kyra Harper) in a bar, and Annie is initially both tough and hostile. But they bond over some drinks and start to develop a relationship. And Sophie accepts Alex’s business proposition, although there are indications on both sides that something besides business is going on. Alex and Sophie on the marriage tractor. The final hurdle is Alex’s parents, the Bresnyachuks, who, in Old World style (they’re Ukrainian), want to negotiate a marriage settlement. Sophie is deeply offended that they expect her to buy Alex, in effect, with title to half the land. Alex tries to woo her back with a horse, but ends up giving it to his 13-year-old son Benny, whom he’s never really met before. Strangely enough, Sophie takes that as a good sign. 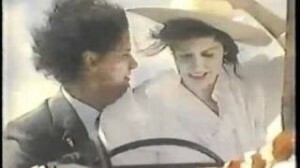 The marriage happens, and they drive off into the sunset on a tractor. As you might guess from this description, a lot depends on how good the two leads are, and they are very good indeed. This is better than the synopsis sounds, with some crisp and feisty dialogue, although not much of it by Alex (Paul Gross), who is an excellent actor (Gunless, Slings and Arrows) in addition to being good-looking. This is fairly accurate in its portrayal of family dynamics, the inability of one generation to talk to another, and the temperaments of some people in cattle country, particularly men. Wendy Crewson, best known as Pres. Harrison Ford’s wife in Air Force One, is very good as Sophie. Things are wrapped up rather expeditiously at the end, particularly Alex’s new relationship with his son Benny. But for light romantic fare, you could do a lot worse. This is a sleeper that should have received more attention. Shot in and around the towns of Cowley, Lundbeck and Pincher Creek, Alberta; the scenery and surrounding country form a significant part of the ride. The sound track includes three songs by Canadian country singer K.D. Lang. Based on a novel by Susan Haley. 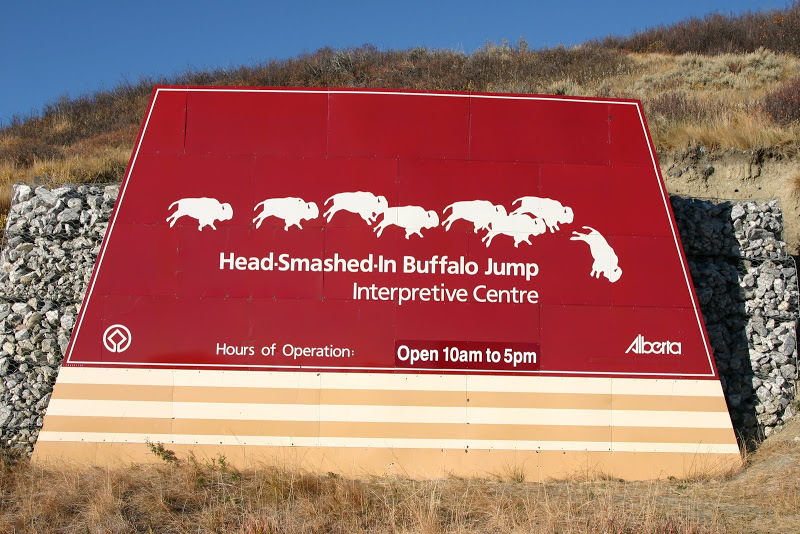 Historical note: A buffalo jump is a site where Indians, before they had horses, drove buffalo herds over a cliff to collect their meat and hides (not a particularly efficient way to hunt). One of the best-known buffalo jumps in North America is in southern Alberta, called Head-Smashed-In, used by the Blackfeet. This entry was posted in Westerns Worth Watching and tagged Made for Television, The Arranged Marriage on August 6, 2015 by Nicholas Chennault. Burt Kennedy started out as a stunt man but quickly moved into writing, particularly for John Wayne’s Batjac production company. His writing career is most notable for Kennedy having penned the best of the Budd Boetticher–Randolph Scott collaborations, beginning with Seven Men From Now (1956). From there he eventually moved into directing, and this was his second movie. The first (The Canadians ) had not been a success. At the start of this film, young Lee Carey (Keir Dullea) is fitfully working a small ranch in Montana, although he doesn’t much like to work. He has fallen in with bad companions, especially his friend Jace (Warren Oates). Into this situation rides aging former lawman Will Lane (Buddy Ebsen), a friend of Lee’s deceased father—a good enough friend, in fact, that Lee’s father left him title to the ranch. Lane is supposed to pass title to the ranch along to Lee when/if he decides that Lee is responsible enough to make a go of it, which he isn’t yet. Lee Carey (Keir Dullea) is introduced to Annie Boley (Lois Nettleton) by Will Lane (Buddy Ebsen). Lane decides that what Lee needs is the love of a good woman and the responsibilities of family life, a view that Lee doesn’t share. Lane heads for Kansas City, where he meets Hanna (Marie Windsor) at her saloon. When she hears about his quest, she steers him to Annie Boley (Lois Nettleton), a widow with a young son who works cleaning up the saloon/hotel. She nervously agrees to give the idea a try, and Lane, Annie and son take the train for Montana. 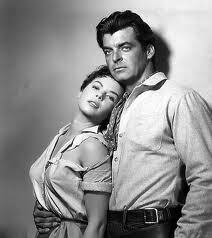 Lee has been hanging out with Marietta (Barbara Luna), his favorite prostitute, when they arrive. He reluctantly agrees to Lane’s proposition, but he doesn’t anticipate the arrangement will be permanent. To his credit, he also explains his approach to Annie, so she doesn’t expect anything more. Meanwhile, he tries to put on a good front, building a new house for Annie and son and working the cattle so Lane will give him the title to the place and he can return to his old life. Lee (Keir Dullea) tries to persuade Will Lane (Buddy Ebsen) that he’ll take care of his new family by building a house. He likes Annie well enough, but finds that Marietta will no longer consort with him now that he’s a married man, since she seems to take marriage (even a sham marriage) more seriously than he does. In frustration he gives up and sets up a plan with the no-good Jace to steal all the cattle. Jace tries to expedite things by setting fire to the half-built cabin, almost killing Annie’s young son Matt in the process. That finally tears it for Lee, who has bonded with the boy (and with Annie, to some extent). He seeks Lane’s help in rectifying things. When Jace declines to give back the cattle, a classic showdown confrontation follows. At the end, although both Lee and Annie want him to stay, Lane rides on because they no longer need him–kind of like an aging western Mary Poppins. He appears to be headed to Kansas City to renew his acquaintance with Hanna. This is slight and predictable fare, but quite watchable—more than a synopsis of the plot would suggest. The two performances that make it work are by Buddy Ebsen, who plays Will Lane with some restraint and believability and a little steel, and Lois Nettleton, as Annie, the hopeful young widow with a son. Not conventionally beautiful, Nettleton is now remembered principally for her work in middle-aged character parts, but here she is excellent as a young woman in a role that calls for vulnerability and some nuance. Keir Dullea (now remembered mostly for 2001: A Space Odyssey) does well enough, but, aside from treating Annie reasonably well, his character is written so that there’s not much else to recommend him after he’s spent almost the entire movie as a wastrel. Warren Oates plays Warren Oates’ usual sort of character very well. 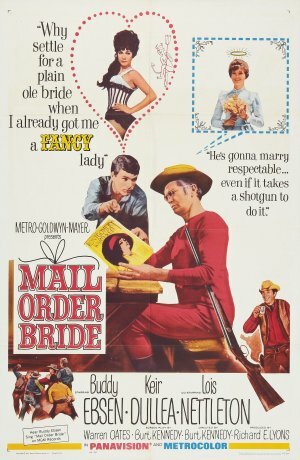 There are also good character actors here: Paul Fix as the local sheriff, Denver Pyle as the preacher who marries Lee and Annie, and especially Marie Windsor as Hanna, the warm and wise Kansas City saloon proprietor. This alternative poster features not Annie Boley but Marietta (Barbara Luna) in the center. Buddy Ebsen had started on Broadway as a dancer with his sister Velma, eventually co-starring with Shirley Temple (Captain January, 1936), Judy Garland (Broadway Melody of 1938 ) and even being cast as the Tin Man in The Wizard of Oz, until he had to pull out when the aluminum paint initially used in the makeup almost killed him. Before this film, he had been seen principally as Davy Crockett’s sidekick George Russell in the Disney films with Fess Parker. Now he had a television success as one of the principals in The Beverly Hillbillies, and would later go on to star for several seasons as aging detective Barnaby Jones on television. He’s good enough here to make us wish he had made more westerns. Burt Kennedy would hit his peak as a director a little later in the 1960s with The War Wagon and especially with his masterpiece Support Your Local Sheriff. From there it was mostly downhill, as he drifted toward good-ol’-boy westerns with a comedic edge, often featuring country music people. He could be an excellent writer, and he wrote this modest effort. Shot in color around Kennedy Meadows in California’s central Sierra Nevadas, at 83 minutes. It might be hard to find, but it’s decent to watch. An alternative title was “West of Montana.” The title Mail Order Bride has been used for a number of other films and books. Not to be confused, for example, with a 2008 Hallmark made-for-television feature with the same name starring Daphne Zuniga. This entry was posted in Westerns Worth Watching and tagged Burt Kennedy, The Arranged Marriage on August 2, 2015 by Nicholas Chennault.